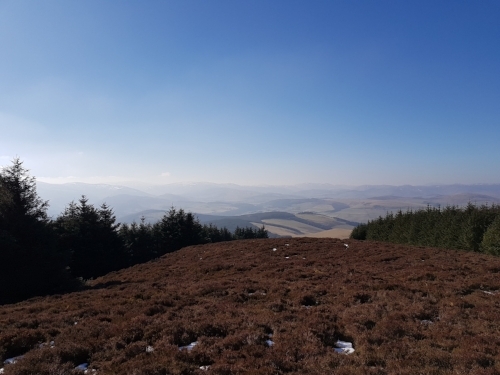 Sunday 25th February dawned bright dry and crisp and I headed down to Peebles for the Glentress Trail Marathon. It had been a last minute decision to enter earlier in the week. My reasons? 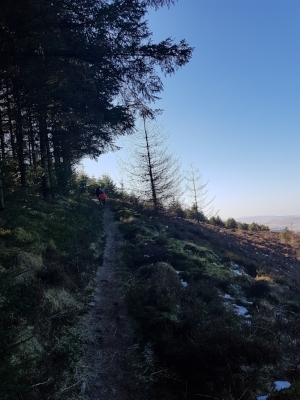 My training was a bit behind and I needed to get a hard long run in and the trail marathon distance with 5k feet of ascent ticked those boxes with change. I arrived at the start with a mixed bag of expectations. It was going to be a bit like dipping into one of those packs of Jelly Belly beans, not quite knowing whether you are going to pull out something delicious or just a bit weird and out there. Was I going to make it a hat trick of last places? Was I going to DNF again? Was it going to be a good day at the office? High Terrain Events specialise in tough, challenging trail races. You can expect a hard day but great support and encouragement from them and plenty of tasty snacks, home-baking and drinks to help you round. 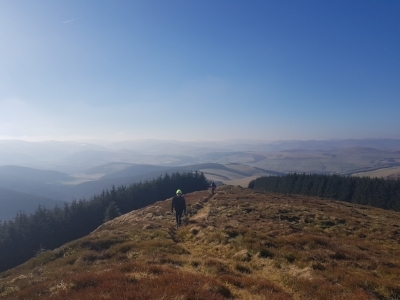 Glentress Trail Marathon is run over a 13 mile loop on forest track, trails and paths with a hefty ascent. It is not for the feint hearted. The conditions were perfect. Sunny and clear with the trails dry and hard underfoot: almost too hard in places where the ground was polished and slippery. I took my time walking and running with occasional stops to admire the views, and to fall into step with other runners for a bit of chat. It was ‘easy like Sunday morning’. Norma (Bone) and I periodically fell into step as we leap frogged along more or less keeping pace. At the highest point of the loop I saw one of the organisers and was able to say with great certainty that I was not in last place for once! Tasty jelly beans so far. I was having a good day out. First loop done in 3:06: good. Yes, I know, very slow but I had predicted 3:15. Norma did a bit of a smash and grab and scooted out whilst I took a little longer to make sure I got some fluid and food on board. Now, lap two, I think I have to say that my school report would have said ‘could have done better’. I set out at a walk continue to eat. The gentle hill that I had run on the first lap was walked. I could see Norma ahead, bobbing in and out of view through the trees and around the twists and turns. Having finished with the eating I picked up the pace a bit and soon pulled alongside Norma again. We fell into step and were companions for the rest of the race, taking it in turns to lead. It felt good to have company and some good conversation and craic: Norma is excellent company. I relaxed. It has been a while since I ran a relaxed race. We tackled the climbs at a steady strong pace, upped the pace where we could on the descent without taking risks, neither of us could afford a fall or injury, we were en-route to bigger challenges. I knew we were slower and had expected to be slower on the second lap, but had not realised just how much slower. As we headed downhill for the last few miles we both remarked how good we felt. In my case I was feeling too good and knew that I should probably have pushed harder. A second lap of 3:41! Oops; that’s a bit embarrassing – lazy arse! I should definitely have worked harder. It felt good though to finish, not be last, not get that hat-trick, and not be dead on my feet. It felt good to have had company and conversation. Some days that it was you need, and sometimes that does a lot more for your headspace and confidence than a severe mullering. Here’s to a lazy Sunday.